I’m losing it. I used to be doing this blog every 2 or 3 days, and now it has been more like 3 weeks. It’s not that I don’t have things to say–it’s just that I don’t seem to have time to say it. It’s 7:30 in the morning, and I’m trying to get a blog finished before breakfast. As summer comes on, science fiction fans and gamers get a lot busier. There are more sf and game cons to attend. I’m attending one this weekend as a Game Master at LepreCon 2011–i’m running Troll games. Actually got to play some Tunnels and Trolls yesterday. And, May 7 was Free Comic Book Day this year. As a big comic book fan, it is an important day for me. I grabbed my digital camera and headed out to see what was happening on Saturday morning. About 10:30 a.m. I arrived at Samurai Comics (a place I have mentioned before) and look at what I found. Channel 3 TV was at Samurai to record the madness. If local television news is involved, you know you’ve found the party. The Samurai parking lot was jammed, and the street parking was full for a block in every direction. This showed me I had made the right decision to go to my comic shop instead of straight back to the convention. If there's something strange in the neighborhood . . . who ya gonna call? I thought the Ghostbusters had taken care of this guy, but it looks like they let him out of the holding tanks for special occasions. 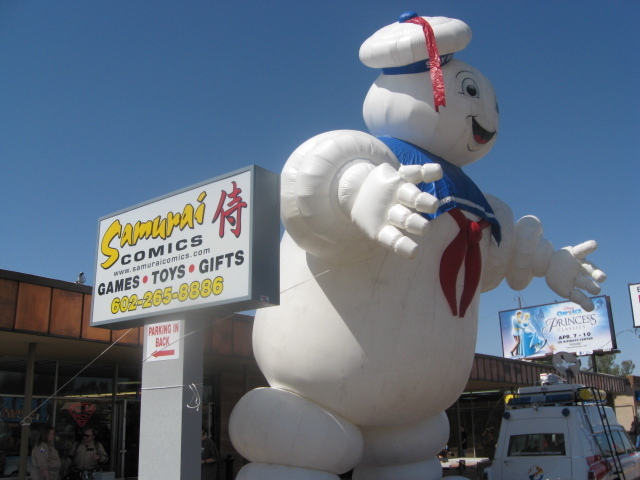 Wherever giant inflatable advertising symbols are on the loose, the Ghostbusters will be on the job. I found Catwoman and Batman inside the store. I have never seen Samurai this crowded–not even on Magic ™ tournament days. Oh yeah, May 7 was a Magic tournament day–it’s Prerelease day for the New Phyrexia set. I wound up buying some new Magic cards before the day was over. The Caped Crusader was surprsingly mellow. 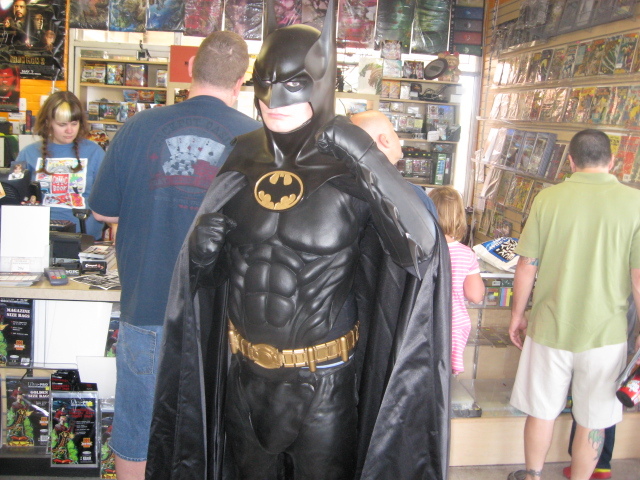 I wonder how much the Bat-suit actually cost. $1000? $5000? And I wonder what it feels like inside all that rubber. They tell me such outfits are hot. The comic book fans of the future are being dragged around by the comic book fans of the past. Free Comic Bood Day is a family thing. I wonder what these little kids think about being dragged around through crowds of strangers and superheroes. They’re probably loving it, and wishing they could run wild. With his movie in all the theaters, the Mighty Thor is making personal appearances. 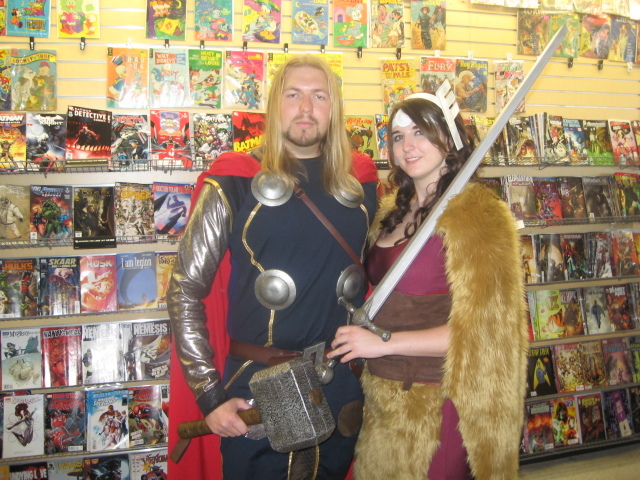 Thor and the lovely Valkyrie are members of the Arizona Aventers–a costuming group that makes public appearances and does things for charity. Fantastic costumes–great job. They have a web presence at: http://www.facebook.com/ArizonaAvengers. 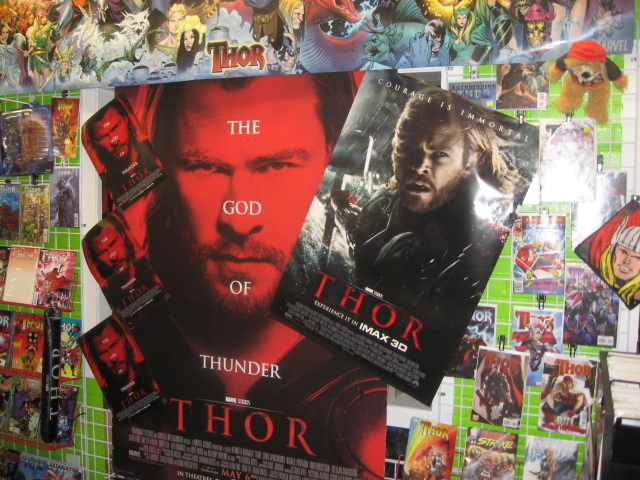 I don't know why Thor is red in the face. Word from my friends is that Thor is a fun movie and pretty good. Critical response to the movie is lukewarm at best–http://RottenTomatoes.com gave it a 78%, but that’s better than most films fare. This is on my must see list, but it will have to wait a week. 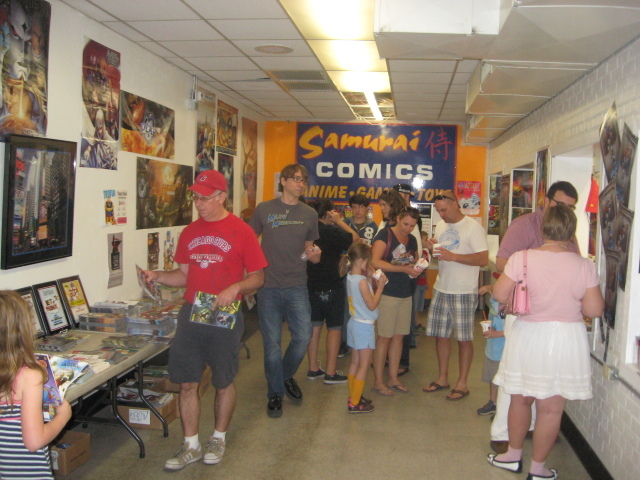 Last but not least, the free comics being given away, and people making their choices. 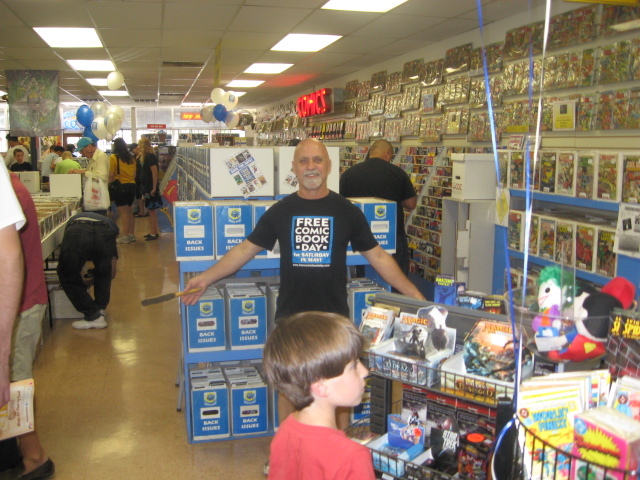 Back in the day (I seem to be saying that a lot lately) you could take as many free comics as you wanted on Free Comic Book Day. 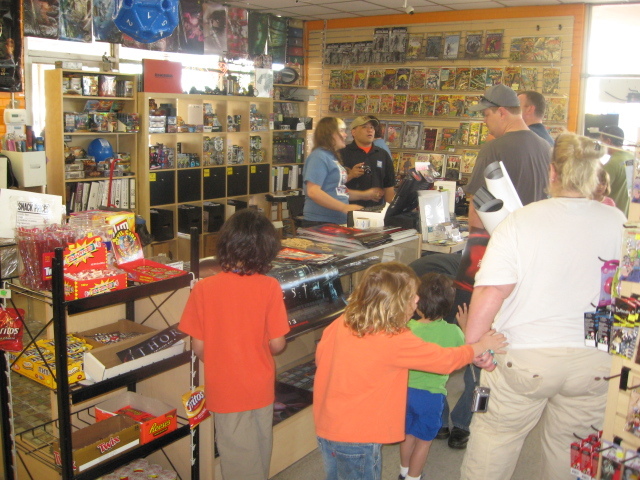 Now, all the stores are limiting the number of comics per customer. It seems to be 2 free comics if you’re the average free-loading fan, and 3 if you’re a signed-up paying customer. I’m signed-up. 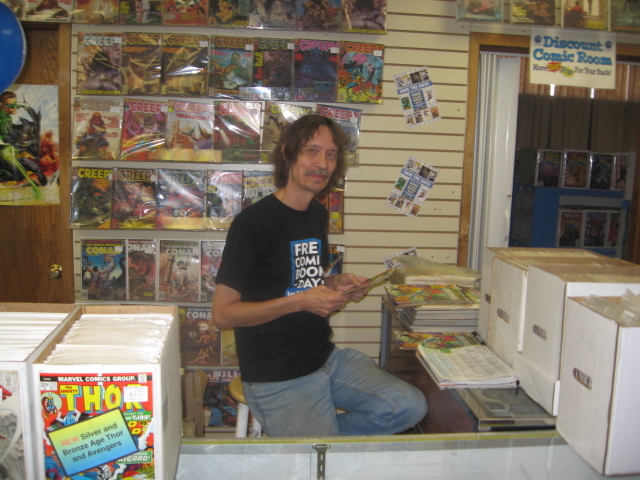 I like to maintain a friendly relationship with my local comics dealers. It helps to know them. I asked politely and also got a free sneak-preview pass to go see Priest when it comes out next week. However, three free comics are not enough for me. I saw more good ones than that, so it was off to the next closest store to say hi to some other friends and get more. My son, Corencio, is eager to get inside the store. 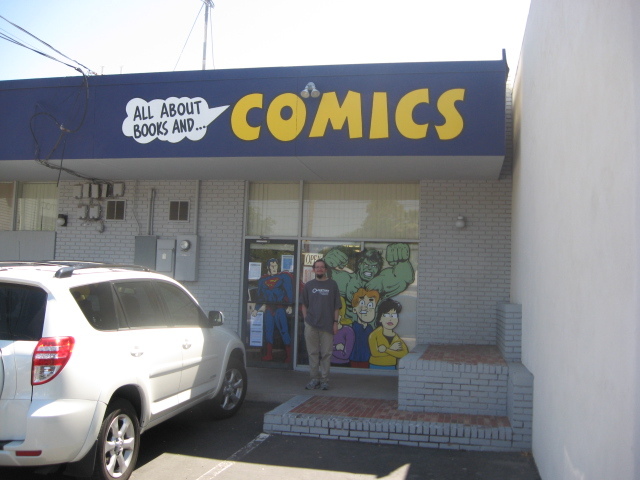 All About Books and Comics was Phoenix’s first true comics specialty shop. They’ve been in business in central Phoenix for about 30 years now. I love this store. It is my favorite place to browse and to chat with the people who work there. My friend Alan is the owner and as cool a guy as you could ever want to know. Phil writes for the Comics Review and knows more about comics than anyone else in the entire world. 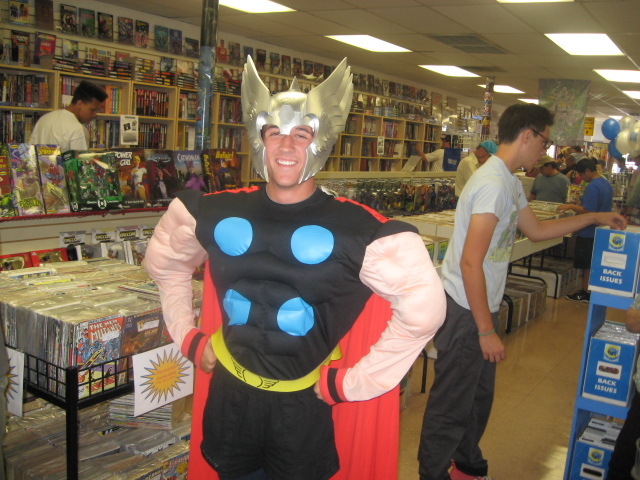 Thor also showed up at All-About. Hmm, this must be a time-traveling Thor from the past. Thor hasn’t been clean-shaven for a long time now. Still, a god is a god, and it’s always great to see one. With 3 more comics for loot, I got out of there and headed for LepreCon. I meant to say great things about it, too in this blog, but I’m running out of time. I’ll talk about my LepreCon adventures in the next exciting installment of: Atroll’s Entertainment!